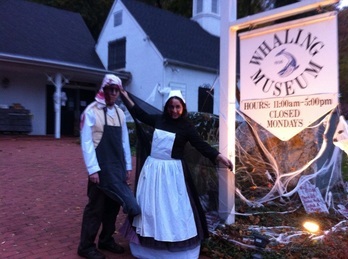 HAUNTED "WAIL"ING MUSEUM VOLUNTEER CREW! Serve your community – have fun, dress up, spook and entertain! WHAT: The Museum hosts the annual Wailing Museum & Festival, where our exhibits come to life with spooky spirits of the past, visitors can play games and make crafts, and meet spooky animals. 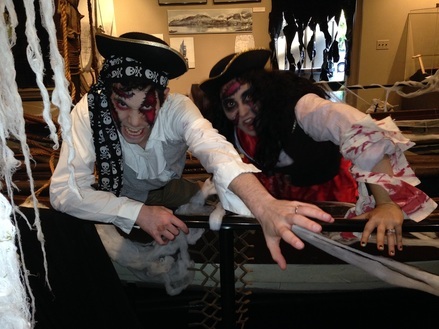 In the museum, visitors meet roving seaghosts, wailing widows, and stranded sailors (facilitated by volunteers like you). Outside the museum, visitors stop by tented stations to dissect an owl pellet, meet unusual animals in our Spook-Tacular Zoo, decorate crafts and masks, wrap a friend into a mummy, search for coins, and earn prizes (lead by volunteers like you)! All ages are welcome to the event. We are a family-friendly destination. See pics from last year's Haunted Museum Here! WHEN: Sunday, October 25, 2015 from 12-4 pm, Rain or Shine! POSITIONS: We are looking for volunteers of all ages, starting from 14 years old and up. We will consider younger volunteers with a good character reference. Haunted Actors & Actresses – Bring the Haunted Museum to life by taking on a ghostly character to interact with visitors, from wailing widows to stranded pirates to starving sailors. Dressing up and make-up is required (we're happy to supply the costume, but if you have historical-looking items of your own, including bonnets, walking canes, long skirts, shawls, top hats, pirate outfits, etc., bring 'em!). Must arrive by 10:30 am on the day of the event. You're right for this position if you can: 1) remain in character throughout the event (leave the texting for later!) 2) can work as part of a team or individually 3) can present a professional personality while acting 4) be spooky, but not horrifically scary. When you arrive, we will place you in a designated spot in the museum for you to haunt (such as the Medic Ward, Graveyard, Zombie Whaleboat, Jail, etc.) - but you will have some leeway for improvising. You can talk as much or as little as you like! Activity Table Attendant- Help oversee our many stations such as gross, sticky touching tables, dissecting owl pellets, mixing slime, making potions, bean bag tosses, looking for coins in the sand. You're right for this position if you're friendly, cheerful, and responsible for keeping a potentially messy-looking table neat. Must arrive by 11:00 am on the day of the event. Costume not required (but if you want to dress up in a spooky costume or wear a witch hat, sure!). Craft Table Attendant- Oversee craft tables such as decorating masks, making paper black cats and pumpkins, and making other fun Halloween crafts. You're fight for this position if you like being crafty, can explain instructions to kids of all ages, can keep supplies in order, and are friendly. Must arrive by 11:00 am on the day of the event. Costume not required (but if you want to dress up in a spooky costume or wear a witch hat, sure!). Haunted Exhibit Designer - You transform the Museum into an awesome spooky lair! Do you have an eye for spiderwebbing the place? Can you arrange bones in a graveyard? Can you help put out tools in the medic ward to look creepy as ever? Then we would love your help and artistic vision! We will be turning the museum into the Wailing Museum from October 21-23. Please scroll down within the form below to complete your entry.